Summer is a great time to get outdoors and enjoy the weather, but the sun's rays are strong and temperatures are hot. It's best to ensure your loved one is dressing appropriately, wearing sunscreen, a hat, and finding shade when needed. But most importantly, it's vital they stay hydrated. Hydration is especially important for older adults because our bodies don't retain as much water as we age. This makes us more susceptible to dehydration, which can lead to decreased health. "The better hydrated you are, the healthier you are," says Mark, National Director of Culinary Operations for The Goodman Group. Here are some tips to ensure your loved one stays hydrated this summer and beyond. It may not be the most convenient thing to do, but carrying a water bottle everywhere serves as a reminder to stay hydrated and allows constant access to water. "It's as important for residents to carry a water bottle as it is for younger people," Mark says. "I think sometimes residents view it as not well-mannered to drink water out of a bottle. However, the disadvantage to that is you could go a long time without water." Your loved one doesn't need to carry a plastic disposable water bottle around that crinkles each time it's opened. Have them choose one at the store — a patterned or colored one, perhaps. "Find your favorite water bottle and drink away!" Mark says. Not everyone likes the taste of plain water. If your loved one falls into this category, don't worry. There are countless ways to improve the taste. For example, like many of The Goodman Group managed communities, you can infuse your water with fruits, vegetables, and herbs. Some of Mark's combinations include pineapple, strawberry, and mint; honeydew and sage; cucumber, lemon, and cilantro; orange, blueberry, and basil; lemon and thyme. Not sure where to start with infused water recipes? 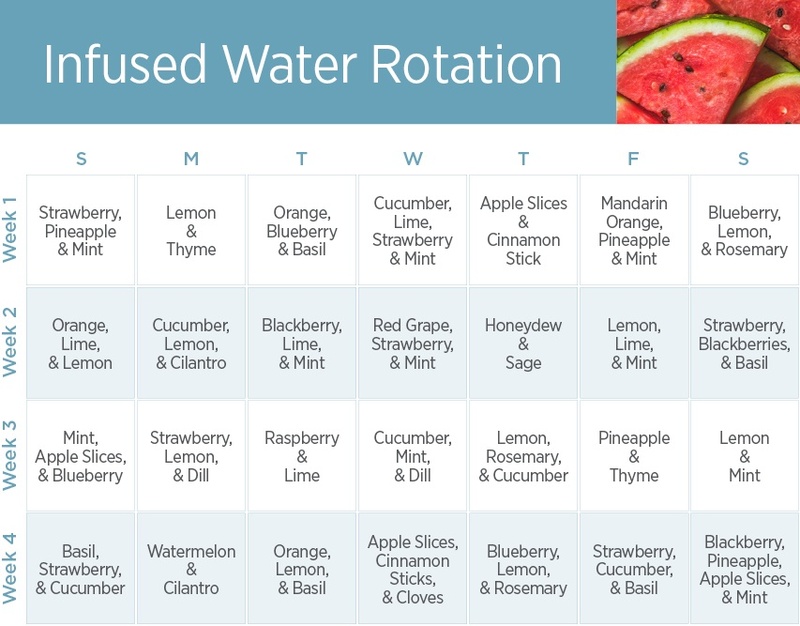 Download our infused water calendar for a little inspiration! Crush fibrous ginger root, rosemary, and lemongrass with a muddler or wooden spoon; tear or crush leafy herbs like mint, basil and cilantro to release their oils. Loose herbs and flowers - lavender, rose petals, dried hibiscus - can be corralled in a tea infuser or cheesecloth. You can also make unique lemonade recipes. Mark enjoys experimenting with flavors when it comes to lemonades, too. Some of those that stand out are his lavender lemonade, mint lemonade, sparkling ginger lemonade, and sparkling kiwi lemonade. Speaking of fruits, hydration comes not only from water but foods, too. "In the summer, Mother Nature provides us watermelon, strawberries, and all kinds of fruits that will give us hydration," Mark says. He's right. 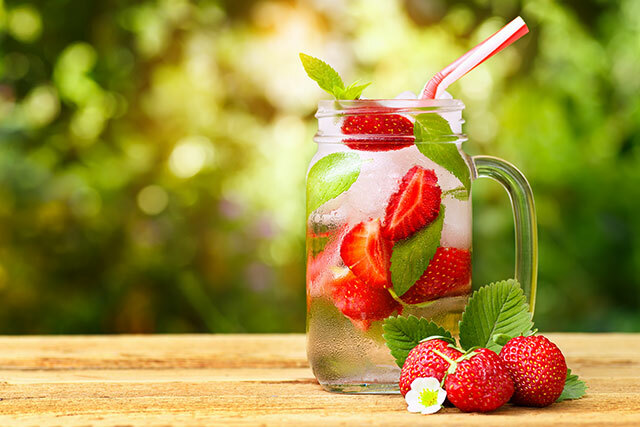 Fruits of any kind — melons, berries, pomes, tomatoes — supply our bodies with small amounts of water. "You can eat your fruit with other foods, but avoid dry foods," Mark says. 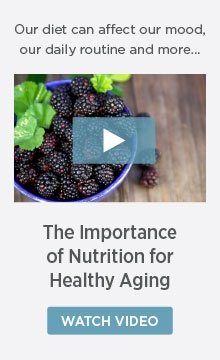 "For example, enjoy your blueberries in a cream versus a cookie." Vegetables — squash, zucchini, broccoli, cauliflower, peppers, and cucumbers — also provide small amounts of water. This is especially true if you steam them. "I also recommend eating iceberg lettuce in the summer because it has higher water content," Mark says. "It doesn't have much nutritional value other than water." These foods paired with several glasses of water, lemonade, or tea per day and your loved one will be well hydrated and healthy.